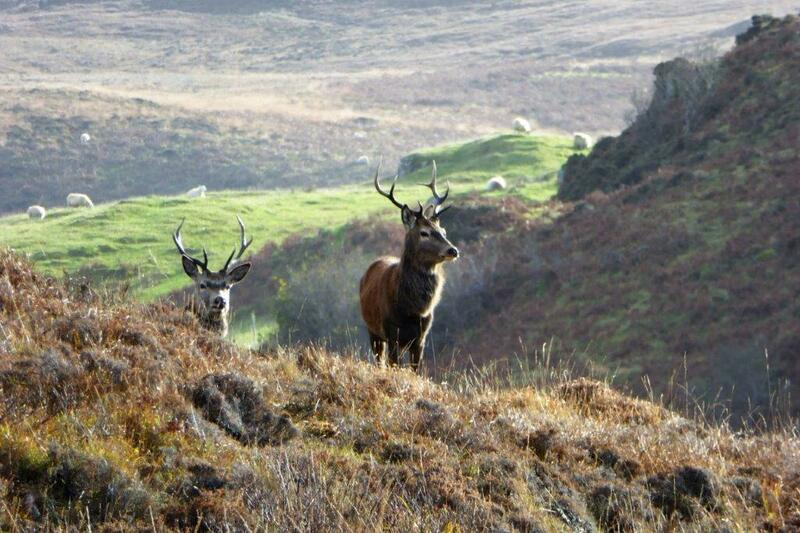 Any trip to the Scottish Highlands for us begins shortly after we leave our house and this trip didn’t disappoint. 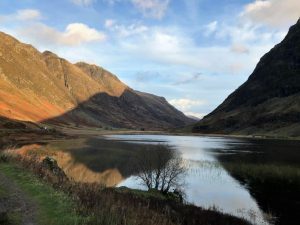 Although the weather could have been kinder, the scenic journey along the A84 via Callander and the A85 via Crianlarich was very enjoyable and the haunting and dramatic views along the A82 via Glencoe are always impressive in any conditions. Just after Onich, we crossed Loch Linnhe via the Corran Ferry to Ardgour. 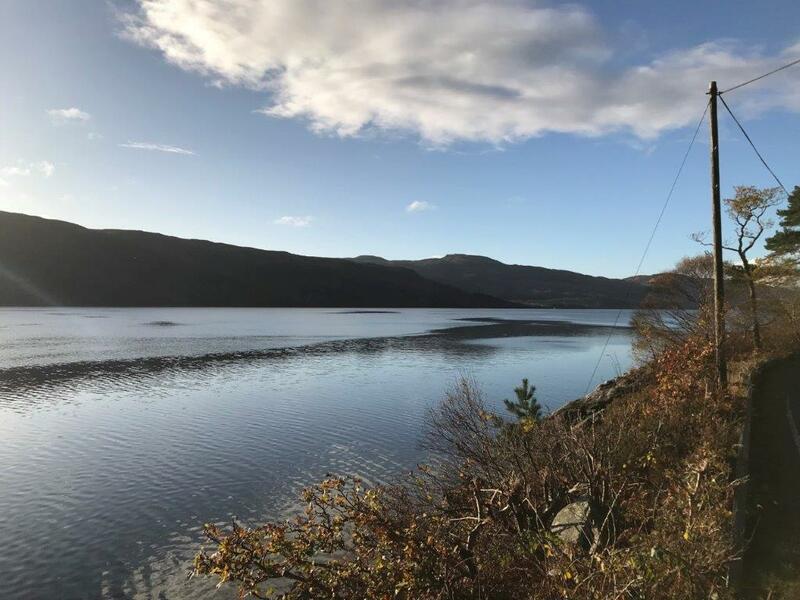 A short crossing, but this cut around 20 mins or so from our journey time compared to the Fort William route; always worth considering if you’re comfortable with ferries. We were heading for Garmoran Square, a development of four luxury self-catering apartments situated in Mingarry, Moidart in the picturesque west coast of the Scottish Highlands and north of the Isle of Mull. Each apartment has a historical link to the area and you can find out more during your stay if you take time to delve into the well-stocked book shelves. 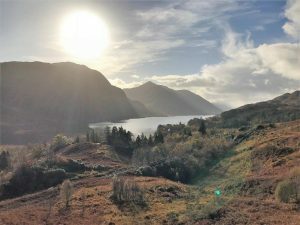 Moidart is best known as Bonnie Prince Charlie country as he arrived in Kinlochmoidart in August 1745 landing at Castle Tioram on route from France setting sail up Loch Shiel from Dalilea. 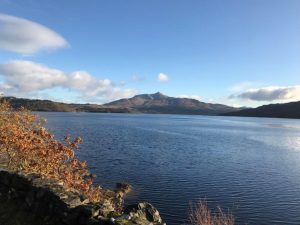 Worth reading up on the history before you arrive as you’ll immediately fall in love with these stories and the folklore the area has to offer. Mingarry is a small crofting township with several public dwellings as well as a mixture of traditional crofts, some private houses and Mingarry Park, which we will tell you about later. 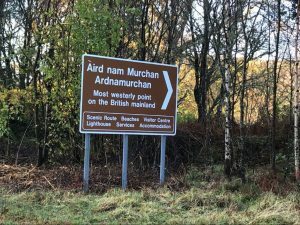 Garmoran Square is at the gateway to Ardnamurchan, just 1 hour from Fort William, Ben Nevis and Nevis Range in the north east and just over an hour to Ardnamurchan Point in the west. It is also within easy reach of Mull, Skye and the small Isles of Eigg, Muck and Rum during the summer season – although worth pointing a boat or ferry is needed for these visits! Garmoran Square opened in 2006 and is built on croft land to the side of Susan and Kenneth MacDonald’s home. Their concept was to build a luxury treat to allow people to share the beauty and history of this area. In our view they’ve certainly achieved this – watch Susan tell you about it here. 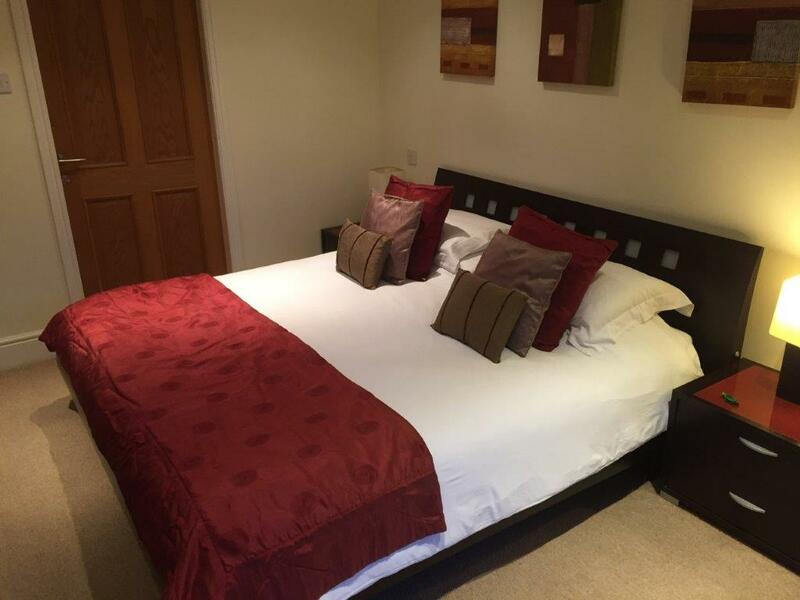 Although Garmoran Square is rural it’s only a 5 minutes’ drive from a baker, grocers, tearoom, hotel, pubs and restaurants. We were aware early November is the beginning of the low / winter season, so some places had limited opening hours, but it didn’t really affect our stay at all and just meant we spent more time outdoors. 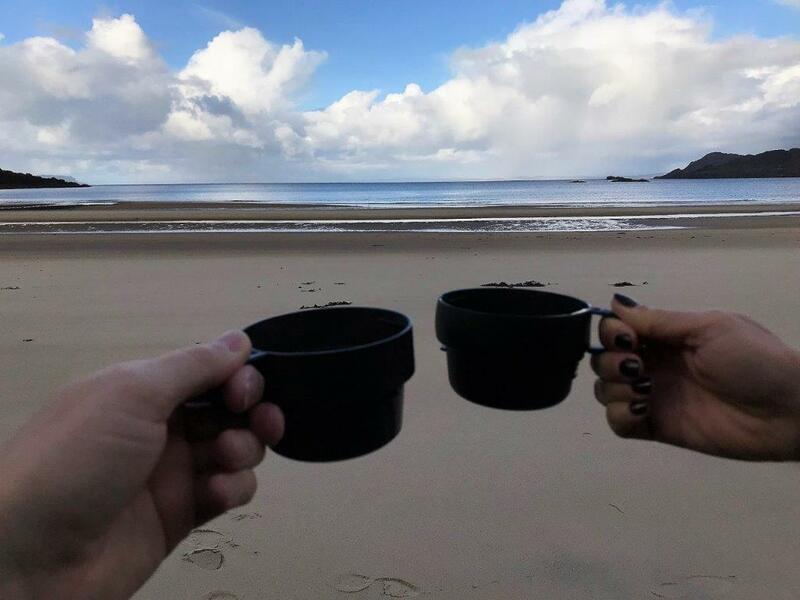 There’s nothing better than trekking through the Scottish Countryside, pouring yourself and enjoying a nice cup of coffee / homemade soup before your return leg. We were staying in the Tioram apartment (pronounced cheerum) at the southeast corner of the development overlooking Ben Resipole. 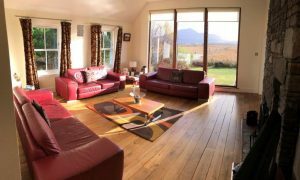 The three main apartments are well orientated to maximise the sun in the afternoon and evening and to enjoy the early morning sunrise over Ben Resipole. Susan met us on arrival, which is always a nice touch, and we immediately felt at home with her. 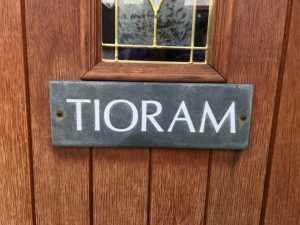 She gave us a brief tour of Tioram, essential tips on the heating controls and some advice on places to visit and walk in the area. 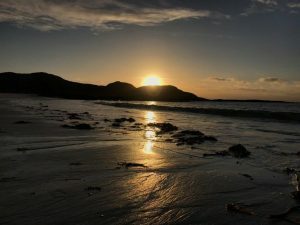 She was welcoming and warm; and it was clear that she had a passion for the area and was proud of what she and Kenneth had achieved at Garmoran Square. 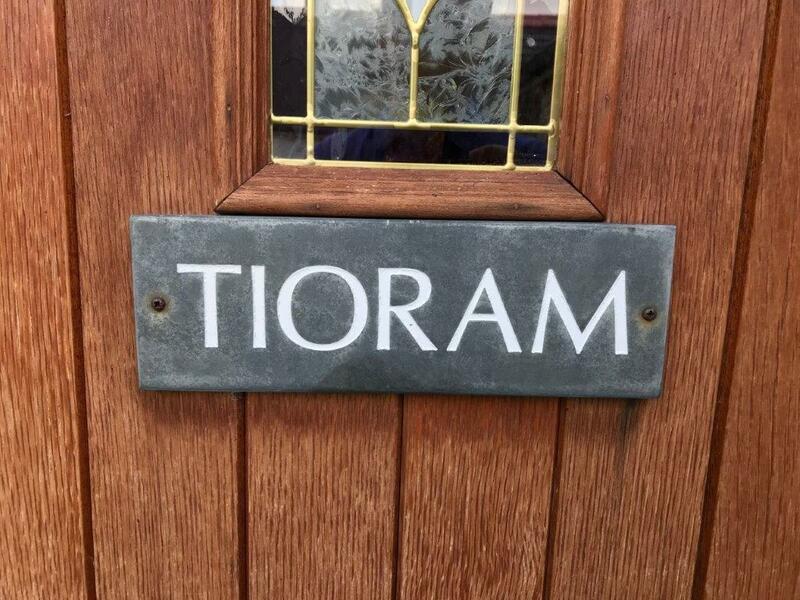 Tioram is a 3 bedroom five star ground floor apartment, sleeping 6 with 2 double and 1 twin rooms all with en suite. 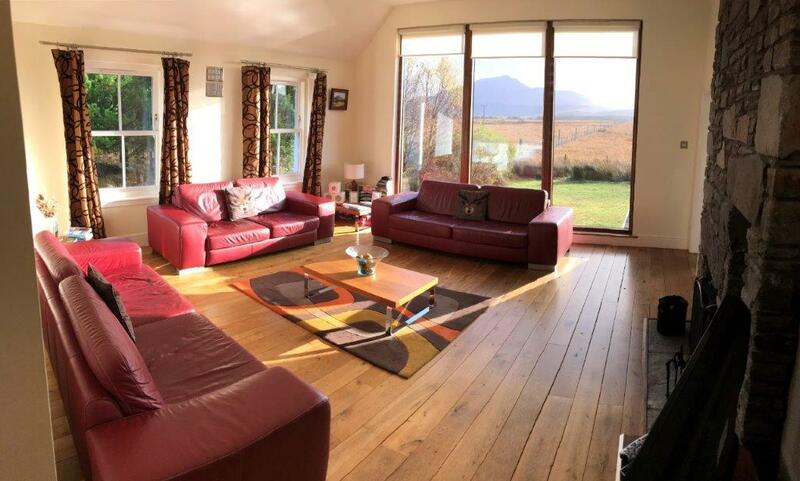 The large lounge has floor to ceiling windows with outstanding views of Ben Resipole to the south. 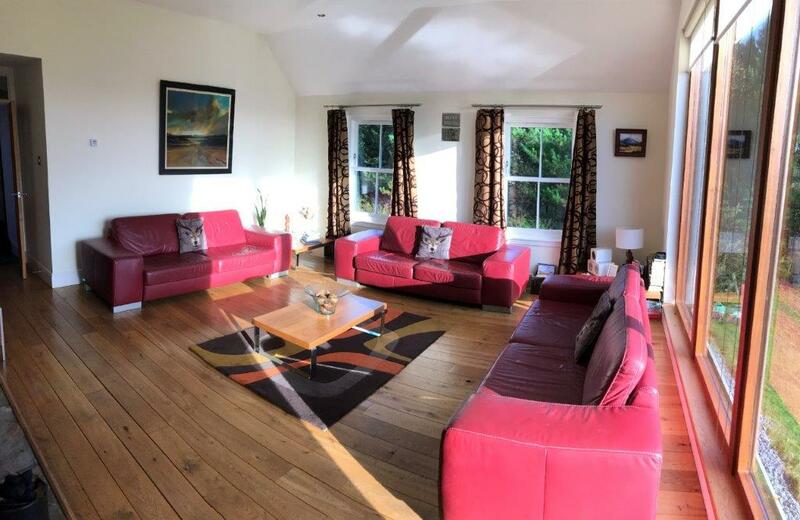 Three large settees make this an ideal space to settle down or gather with friends if there are more of you. 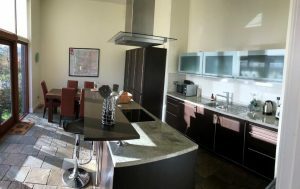 The kitchen / diner is bright and modern and in our view one of the best kitted out in terms of crockery, cooking implements and gadgets; it’s a perfect space for cooking and socialising at the same time not to mention the view to be enjoyed through the full length windows. The apartment also had good internet coverage with decent download speeds for an area like this. 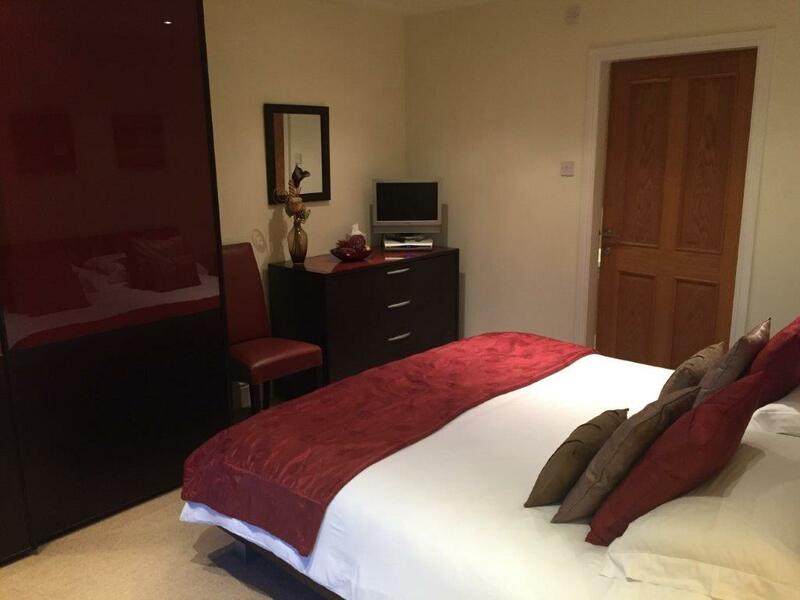 We unpacked quickly and easily as there was of plenty hanging space and drawers in the main bedroom. 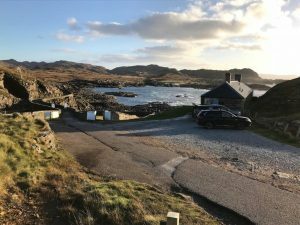 It was also no trouble at all for us to plug in our Outlander Hybrid and Susan made sure this was possible giving us access to her small outbuilding next to the car park. Your first night at a new place isn’t always the best, but here we felt at home and relaxed immediately. We settled down with a box set (this time Suits Season 4) and enjoyed our customary Scottish gins. 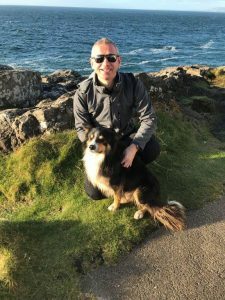 This time we were trying Kirkjuvagr’s new Storm Strength and Arbikie’s Kirsty’s Gin. 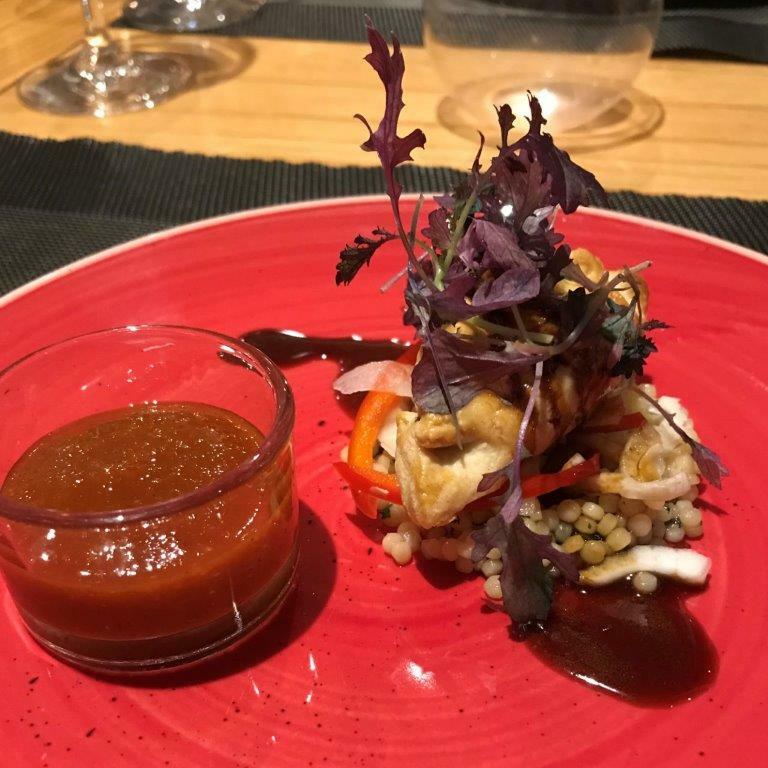 Both went down very well – but be careful with the storm strength. 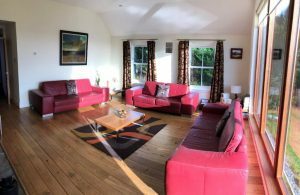 Although tempting, who doesn’t enjoy an open fire, we never needed to use the log burner during our stay as the underfloor heating throughout the apartment was more than enough, keeping us warm and toasty. We had a very peaceful first night sleep in a very comfortable and cosy super king size bed – perhaps the gin helped a little. We woke early to get our Autumn in Ardnamurchan adventure underway! A key plus point for any place we stay is how good the shower is and Tioram didn’t disappoint– a great refreshing start to our day. Our bathroom was modern, bright with a ceiling velux window and nicely finished with floor to ceiling tiles. 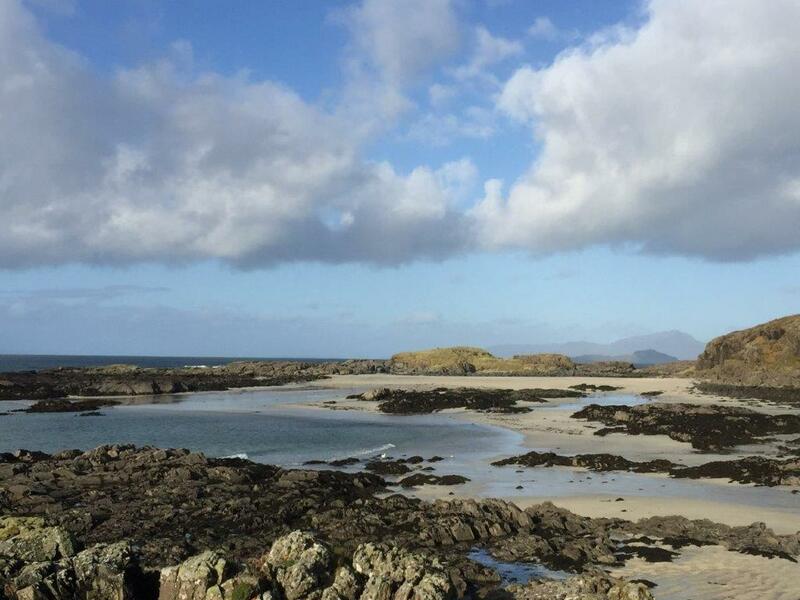 On a map this part of Scotland may appear vast, but in terms of distance it really isn’t. However, given the single track roads places can take a little time to reach – not a problem mind you given the stunning scenery on route. Being centrally located is essential to ensure you maximise your time at different places – Garmoran Square is perfect for this and an ideal base to explore this area. 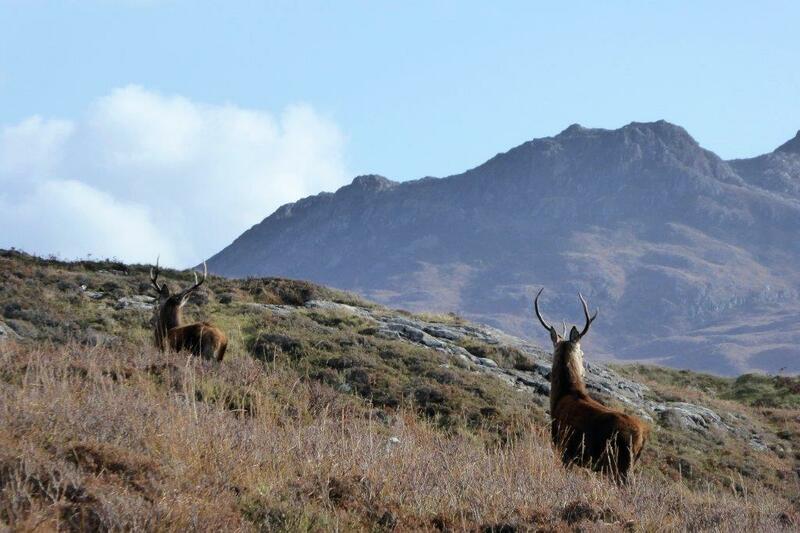 Moidart and Ardnamurchan are renowned for their spectacular scenery with some of the best beaches on the west coast and the area offers wildlife in abundance. First up on the Saturday was a visit to the Singing Sands, near Kentra. 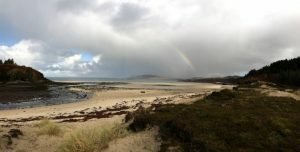 The early morning forecast wasn’t the best, but, although cold, we ended up enjoying some lovely spells of sunshine. 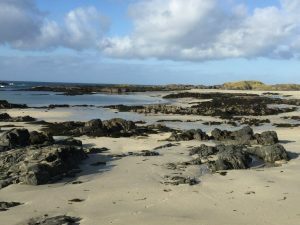 The start of the walk was a 10 minute drive from Garmoran Square, the walk to the Singing Sands, there and back, was along tracks next to Kentra Bay and then through forestry plantation before emerging at the white sands. It was low tide and Kentra Bay was a large expanse of mudflat with small fragments of salt marsh, sand dune and machair. 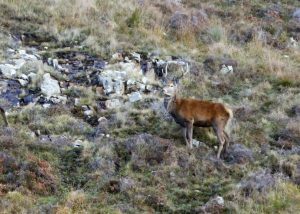 Wildlife was limited along the route to water birds, although we’re sure we spotted a mountain hare, searching for food. 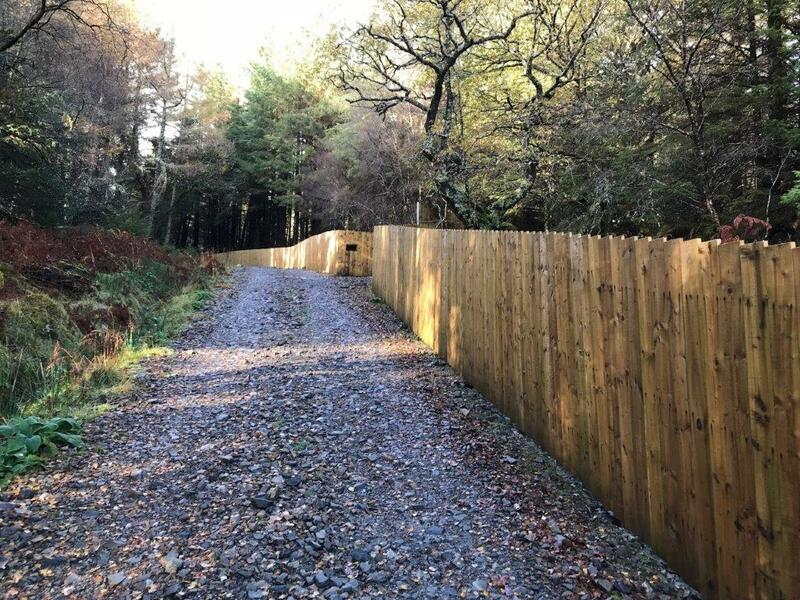 The section through the forestry plantation was pleasant but somewhat spoiled by the 6ft high close boarded perimeter fence left over from Channel 4’s failed social experiment Eden. Hopefully Channel 4 and the estate return it to its natural look sooner rather than later. The walk was worth it when we emerged from the trees to cross the small dunes and head onto the singing sands. We had the entire beach to ourselves. 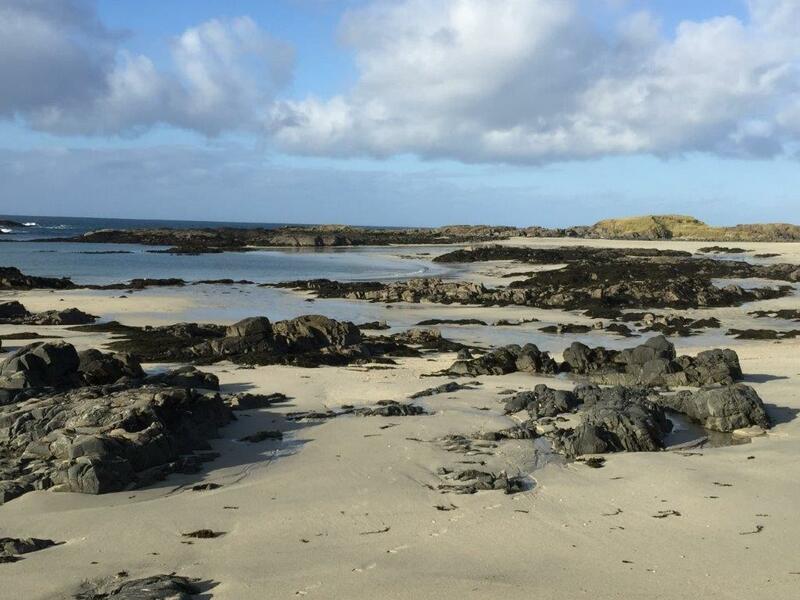 At low tide the sands stretch right across the bay and normally allow plenty of scope for exploring along the coastline to the right. 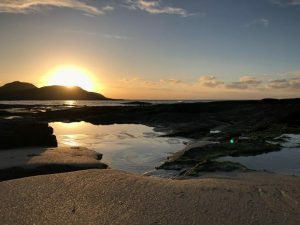 Sadly, we were midway between low and high tide and, although we tried, we couldn’t quite get around to the northern beach which formed part of the Eden ‘set’. To make the sands sing we had to shuffle across with either bare feet or shoes – given the temperatures we chose the latter. The noise is made by the grains of sand rubbing together. The grains are completely round and seemingly had the right level of humidity to generate the low frequency sound. Despite repeated attempts, sadly, we never heard any ‘singing’. That said, sliding your feet along a beach that is littered with signs like this makes you more than a little careful about what you’re doing with your feet. The weather was mixed, but all in all it was a very pleasant walk with stunning scenery at the end and even a rainbow making an appearance for us. 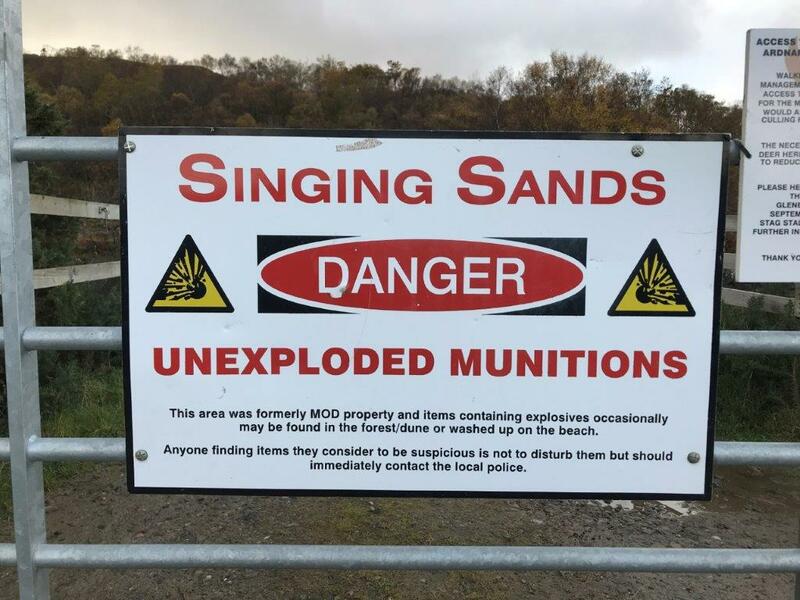 Impressively we had a 4g signal at Singing Sands, which even allowed a brief catch up on our Social Media, unfairly worrying our families, by sharing pics of the explosive signs. 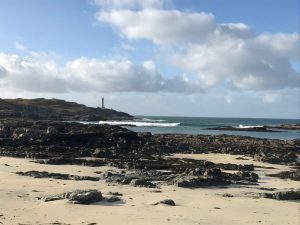 Our trip to Sana Bay, Portuairk and Ardnamurchan Point the next day was perfect; the Scottish weather had played an absolute blinder for us. One of the good things about this area is that within seconds of setting off on a trip you are immediately surrounded by breath taking scenery and wildlife including birds of prey, mountain goats, deer, otter and seals. Just make sure you keep your eyes on the road as you never know what’s around the corner! 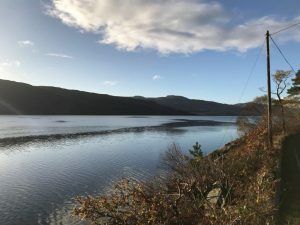 The 30 mile journey along the windy, narrow single track road from Salen was nothing short of stunning; the sun was shining, the blue skies were clear and Loch Sunart waters were glistening. It was one of the most idyllic and scenic drives we have ever taken and took so much longer than planned as we kept stopping for the photo opportunities and glimpses of majestic stags and their hinds in the distance. 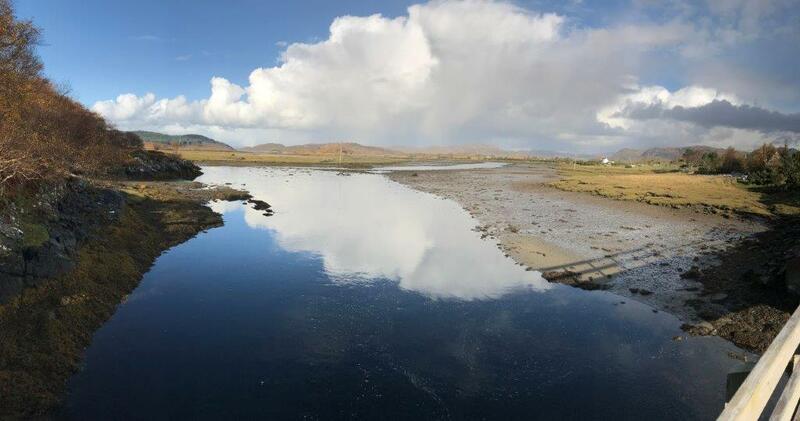 We also stopped off on route at Kilchoan to scout out the ferry terminal for a future trip back over to explore Mull. 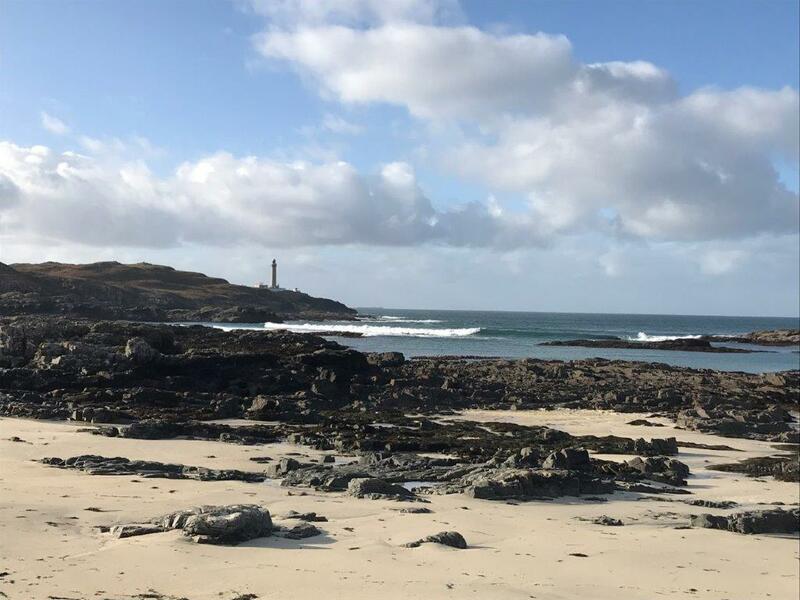 We parked up at Portuairk and set off on foot towards Ardnamurchan Point and a visit MacNeil Bay; a beautiful sandy beach with views out to the lighthouse. We had a lot planned that day, so never took the detour to the lighthouse; that was on our radar for a stopover later. After leaving MacNeil Bay we headed back to Portuairk and had a very special, if not slightly nervous, close encounter with these two lads. 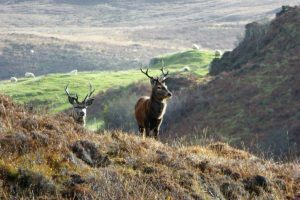 It was the end of the rutting season, so hormones would have been running high, but as we approached they thankfully scarpered off into the hills and we returned to Portuairk. 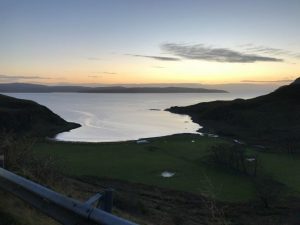 In the afternoon we drove to Ardnamurchan Point. 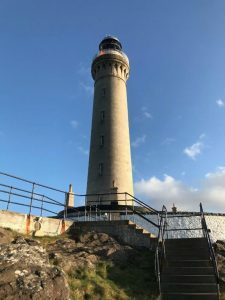 As the most westerly point on the British mainland, Ardnamurchan Lighthouse has been guiding ships safely through the waters off Scotland’s west coast since 1849. The Lighthouse itself stands 36m high, and its top is 55m above sea level. As soon as we arrived we were greeted by Ted and Peigi the two lighthouse keeper’s dogs who guided us on our way to the lighthouse viewing points. The lighthouse was closed for the season, so we couldn’t climb the 152 steps, plus two ladders to the top. We did spend some time at the viewpoints near to the bright red foghorn on the rocks below the lighthouse and at the inside viewing area beneath the front of the foghorn platform. Ted and Peigi had our hearts in our mouths as they bounded across the rocks on the edge of some dangerous / steep drops into the rough seas below. Ted even had some time to pose for a photo – you can see he’s done that pose many times before. 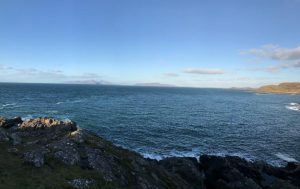 The views were great and we could see the island of Rum to the north, with the Cuillins of Skye beyond. 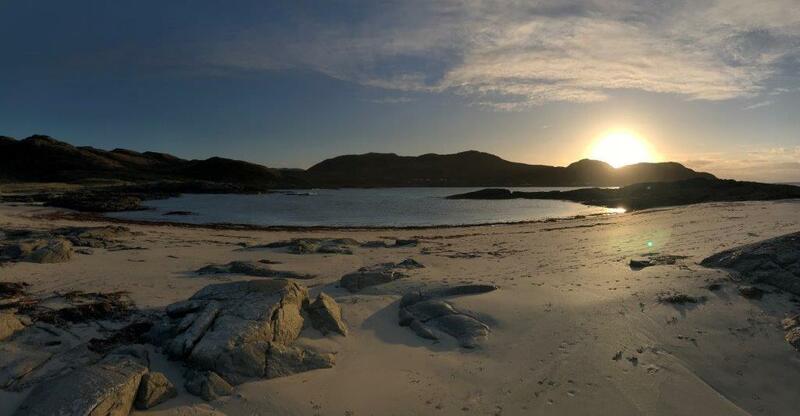 Final stop for the day was Sanna Bay. 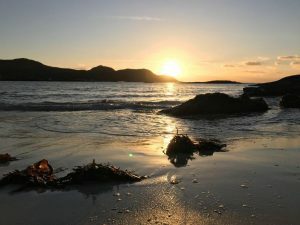 Dominated by beautiful white, shell sand and turquoise sea, the bay is well-known for its magnificent beach and scenery. 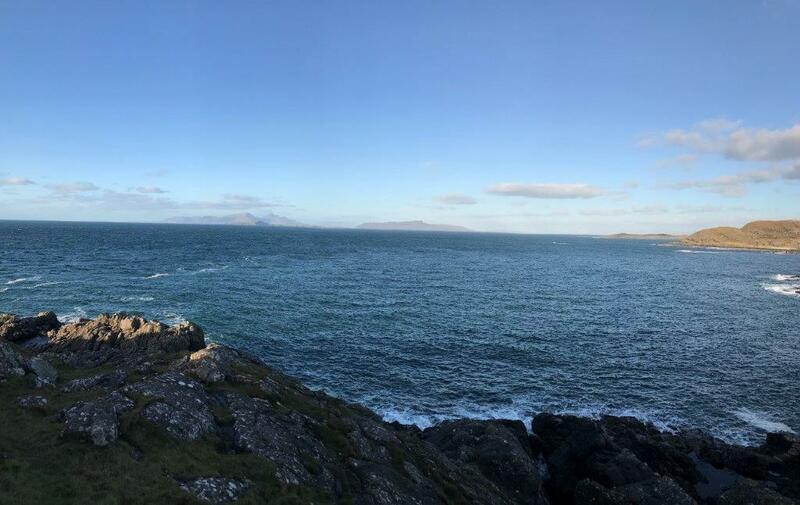 Although it was late in the day, we had superb views of the Small Isles of Rum, Eigg, Muck and the sun was beginning to set to the west. This led to some incredible views and photo opportunities. Sanna Bay is so mesmerising, and its sheer remoteness makes it a special place to visit. 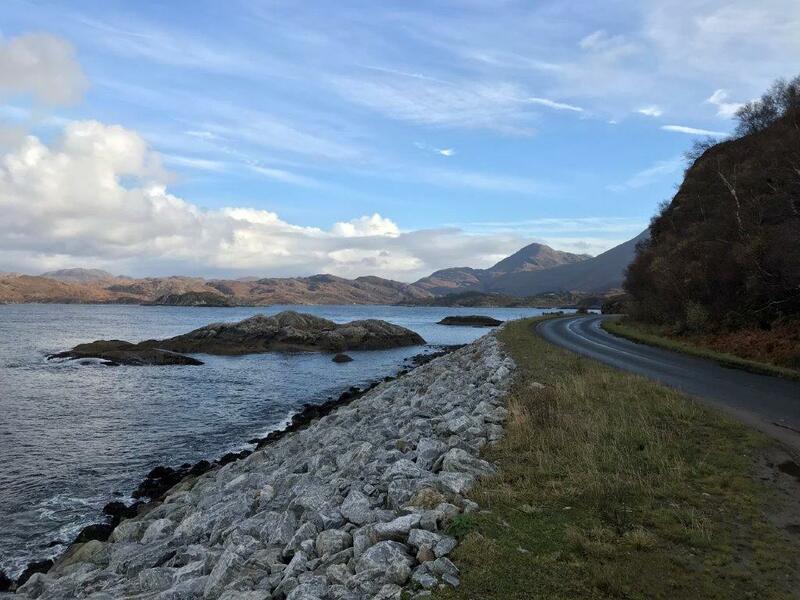 We headed back to Garmoran Square along the single-track road towards Salen. 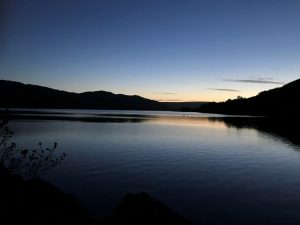 The falling light gave the journey a different ambiance along with some brief encounters with low flying bats and mountain goats. It had been a long day, so we decided to treat ourselves at the nearby Mingarry Park. 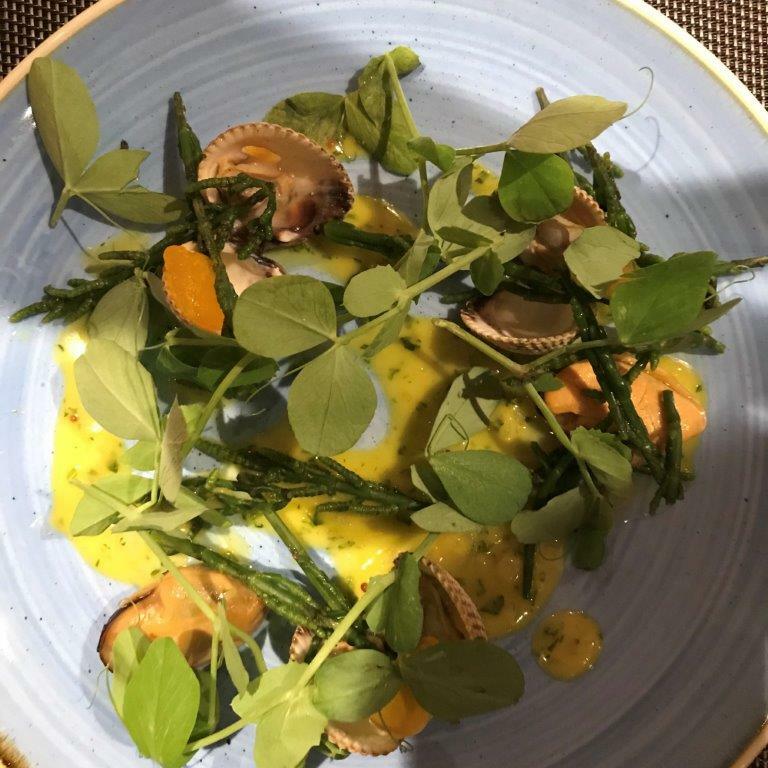 This recently awarded AA rosette restaurant was a 3-minute walk from Garmoran Square and a bonus to have so close to us; more importantly it meant we could both enjoy a nice Sauvignon Blanc with our meal. We ordered Steamed Cockles and Smoked Mallaig Mussels and a Mushroom Bridie to start and mains of Sous-vide Moidart Venison Loin and Pan Seared Sea Bass. 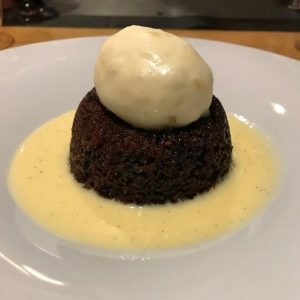 One of us even managed a wee clootie dumpling for dessert! 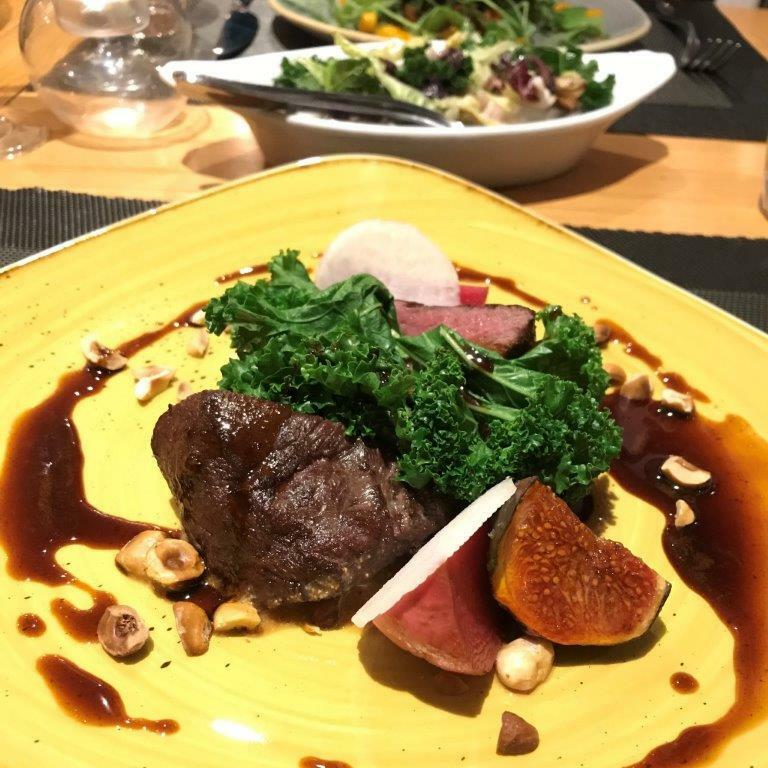 The food, especially the venison loin, was excellent; even better the restaurant was practically on the doorstep of Garmoran Square. 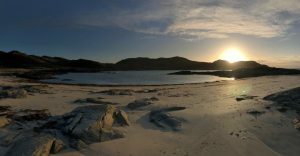 Overall it was a thoroughly enjoyable day exploring Ardnamurchan , followed by a delicious meal after which we headed back for a few more episodes of Suits and a glass or two of gin! In fact, we were so tired from the day, and given the forecast wasn’t the kindest our laziness rolled over to noon the next day. We spent the morning relaxing and enjoying the cosiness of the apartment, freshly brewed coffee, toasted muffins and crispy bacon and reading up on the history of the area. We did venture out later to explore Castle Tioram for a few hours – this was a must given we were staying at its namesake. 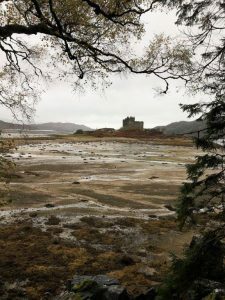 The ruined Castle Tioram (pronounced Cheerum) is sited on the rocky tidal island Eilean Tioram (the Dry Island) where the waters of Loch Moidart & the River Shiel meet. 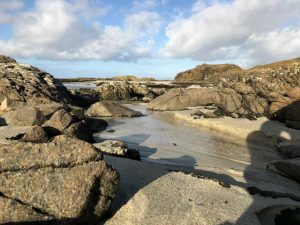 The castle is closed to visitors, but we were still able to visit the island at low tide and managed to get some pictures. We didn’t really have enough time to fully explore and the weather wasn’t the best. 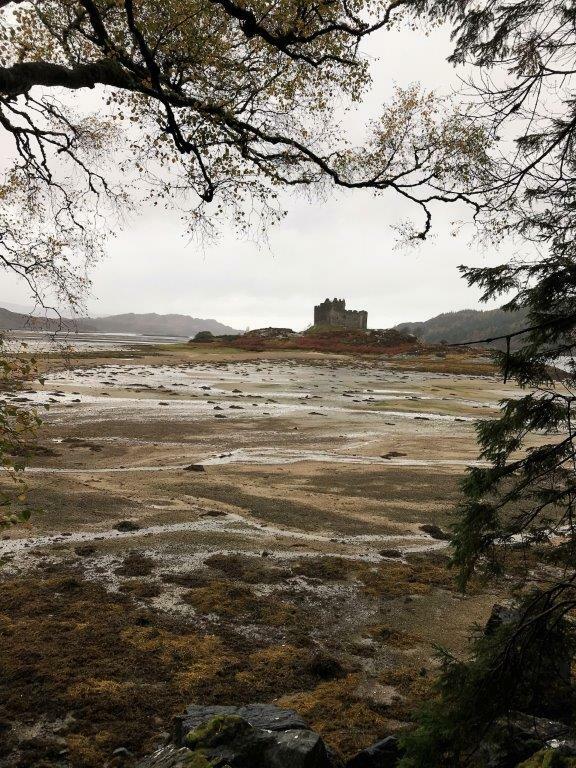 Castle Tioram is first on our list to visit again when we next return and we’ve already started to read up on its fascinating history. 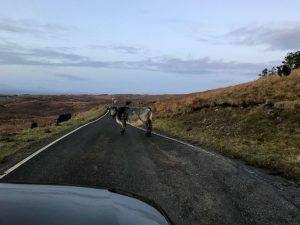 Our journey home was an experience in itself. As you head to Fort William the scenery along the A86 through the village of Glenuig and onto Lochailort is nothing short of spectacular and not to be missed, neither is the ‘magical’ Glenfinnan Viaduct. 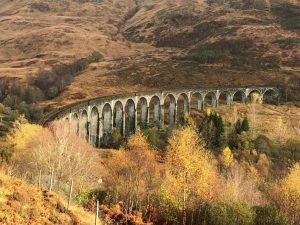 The famous Glenfinnan viaduct carries the railway to Glenfinnan Station across a 1,000 ft span, 100 ft above the ground. The Jacobite steam train runs from here to Fort William and Mallaig in summer months with regular trains available the rest of the year. The viaduct is built from mass concrete, and has 21 semi-circular spans of 50 feet. It is the longest concrete railway bridge in Scotland at 416 yards, and crosses the River Finnan at a height of 100 feet. 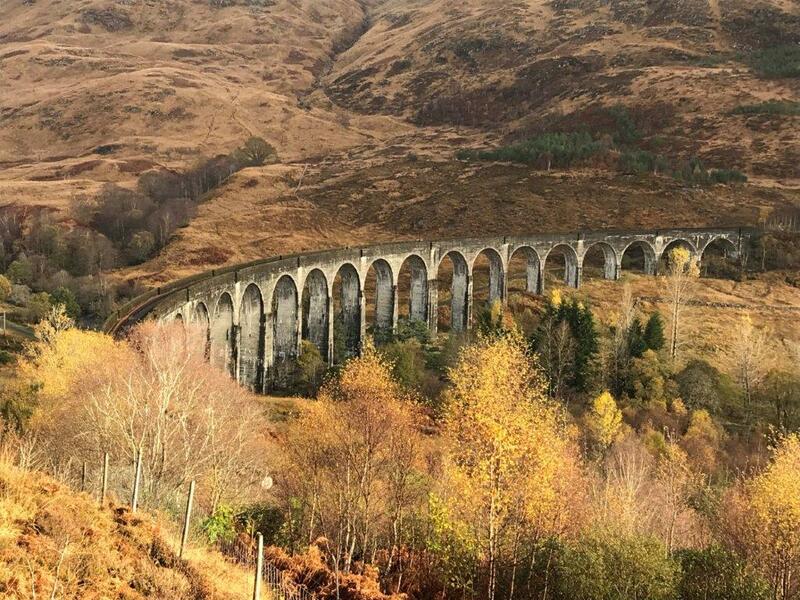 The viaduct is word famous and features in the Harry Potter movies. We parked up just off the A830 and headed towards the viaduct. The path has been much improved in recent years; passing beneath the arches of the viaduct before continuing to climb on the far side. 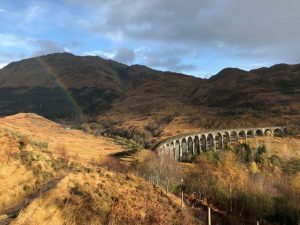 As we gained more height the clouds cleared, and the sun emerged giving us dramatic and ‘magical’ views looking down on the viaduct – made more special by the appearance of another rainbow. We also had an impressive view of the Glenfinnan Monument, but that’s a whole new history lesson for another time. 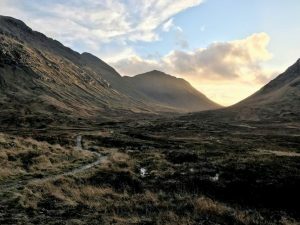 The final leg of our journey home via Glencoe was equally as dramatic as the sun began to set. 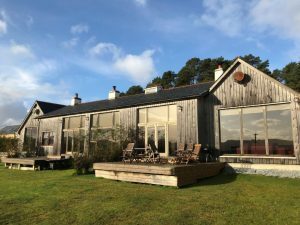 Garmoran Square was perfect for us and we highly recommend these luxury apartments to anyone looking to explore the Ardnamurchan and Moidart peninsula. 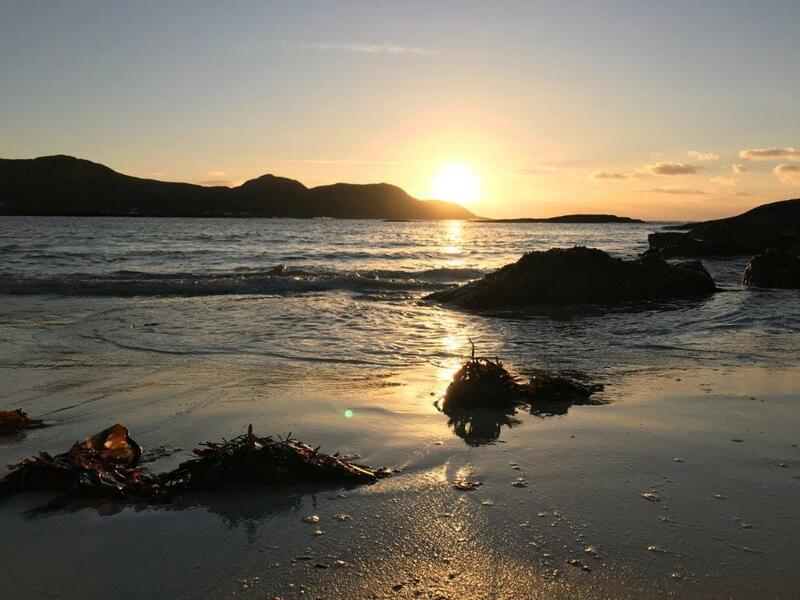 With so much history and scenery Susan and Kenneth have created a perfect base for you to return each day to relax, recharge and reflect on your adventures. Before we left we had a wee peek at the other three apartments and have to say they are all finished to the same high standard – so much so we hope to visit again very soon. Although this was a discounted visit, the review is an independent and true reflection of our experience. 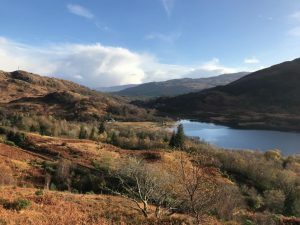 This entry was posted in Scotland, Self Catering, Wildlife / Outdoors and tagged Ardnamurchan, Autumn, Garmoran, Glenfinnan, Lochaber, Mingarry, Moidart, Sands, Sanna, Singing, Square, Tioram by amberpark. Bookmark the permalink.